Do You Use Terms of Endearment Too Often? Terms of endearment are typically used between people who are close – parents and children, best friends, spouses and partners. Most typical are “Sweetheart,” “Honey,” “Sugar,” “Baby,” “Teddy Bear,” “Pumpkin,” and so on. For some reason, food and animal terms are common. But, as I'm sure we've all noticed, some people tend to get too liberal with these affections, using them with people they hardly know and in circumstances when using a proper name would make a better impression. People feel special when you remember and use their proper names. When you first meet someone, using his or her name in conversation establishes likeability. It’s a great way to win friends. However, if you are at a gathering and are calling various people “Honey” or “Darling,” there are a couple of thoughts they may have about this. You are getting too familiar too quickly. And you’ll notice this because your conversations won’t last very long. They assume you don’t remember their name. They may even remind you of their name during the conversation as a gentle correction. When you use a person’s name, particularly right after an introduction, you establish familiarity, and your relationship, at a more appropriate pace. For the people closest to you, calling them by an affectionate nickname makes your relationship even more special. It’s something shared just between the two of you. But there are valid reasons why pet names are reserved only for those close relationships. People you don’t know very well may view your affectionate terms as disrespectful, condescending, or out of place. In a work or office environment, this is not viewed as a professional practice. Some people may feel it is a breach of “personal space” when you use "Honey" or "Sweetie" instead of their proper name. Others who overhear you may feel you are “showing off” your relationship with the person. “Honey,” “Darling,” and “Dearest” can become nicknames fairly quickly, the perfect example being my friend who called everyone he knew “Sweetheart.” Once this becomes a habit, it’s easy to lose your awareness of propriety. My children have noted that I use “Darling” when speaking to my husband in public. When you feel comfortable in the presence of others, you don’t notice to what degree you use affectionate sprinklings when addressing your significant other. In a platonic or professional situation, you may describe friends or colleagues you admire using flattering terms that border on terms of endearment. 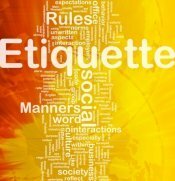 Etiquette guidelines come down to guidelines of kindness and courtesy. If you sense that your playful language might be off-putting to others, try some new strategies when using names. Remain aware during conversations with others. When you're about to use a term of endearment, find an alternative statement that matches what you are feeling and captures the moment. There is a time and place for affectionate terms. Studies show that using them even brings a couple closer. But it’s nice to hear your partner, family member, or friend call you by your name once in a while. Being mindful and thoughtful are always qualities that others will find endearing about you.